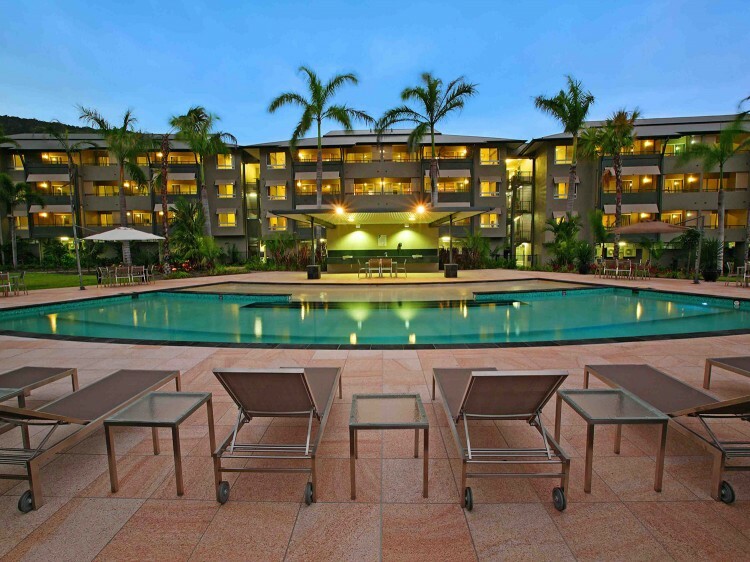 From its idyllic setting just 20 minutes north of Cairns at the base of rainforest clad mountains, Paradise Palms Resort and Country Club invites discerning guests to participate in a truly special visitor experience. Everything associated with Paradise Palms Resort and Country Club is world-class from its master-planned golf course to its prestigious clubhouse and modern resort (opened in 2009) offering a variety of accommodation styles from self-catering apartments to spacious hotel rooms. An extensive range of recreation facilities is offered including resort swimming pool, lap pool and barbecue area. Kids will have fun exploring the Pelicans in Paradise adventure playground. Designed for children of all ages, it features a colourful, circus themed slide village and climbing frame. Under-fives’ recreation area close to the Fifty Nine Restaurant terrace so that parents can relax while observing their children at play. This area is completely shaded, fenced and comprises a ‘soft fall’ ground cover. In addition to the new play areas there are three “Queenslander style cubby houses”, miniature soccer field with goals, a climbing spider, sand pits, swings, slides and a 21m jumping pillow that is great fun for all ages. 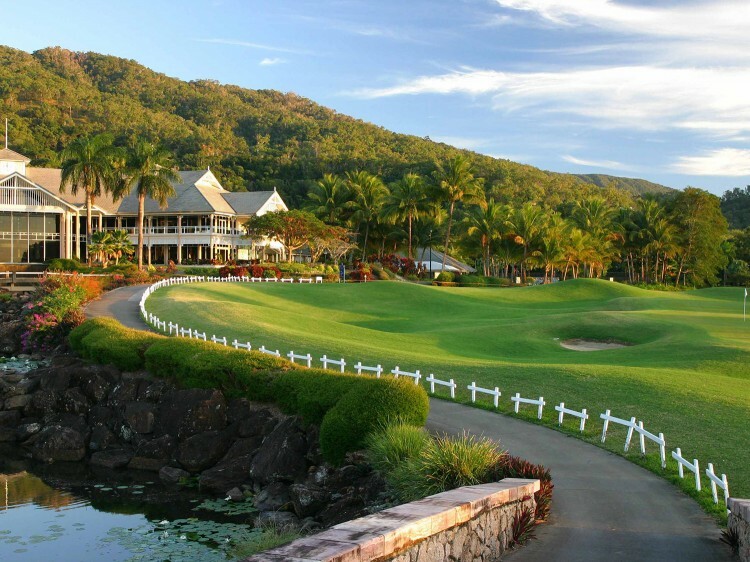 Constantly ranked as one of Australia’s best and most challenging golf courses, Paradise Palms offers a combination of sweeping fairways, snaking creeks, six lakes, narrow undulating greens and 94 bunkers. Open to the public seven days a week, the course is a great test for golfers of all levels. This Queenslander-style Clubhouse is set on the golf course and features a restaurant, cafe, swimming pool, conference and event facilities. Fifty Nine Restaurant & Bar - beautifully fresh and reasonably priced food sourced from local farms and producers. Executive Chef, Matt Dye has created an inspired menu of modern Australian, pan Asian and European dishes for all-day dining. Open daily for breakfast from 7:00am to 11:00am, lunch from 11:00am to 5:00pm and dinner from 5:00pm until late. Officially opened in 2009, Pelicans in Paradise features a 25m lap pool on the terrace, toddler’s pool, adventure playground and 18-hole mini-golf course. Adventure Playground - adding a whole new world of fun for children of all ages, it features a colourful, circus themed slide village and climbing frame. Under-fives’ recreation area is close to the Fifty Nine Restaurant terrace so that parents can relax while observing their children at play. This area is completely shaded, fenced and comprises a ‘soft fall’ ground cover. 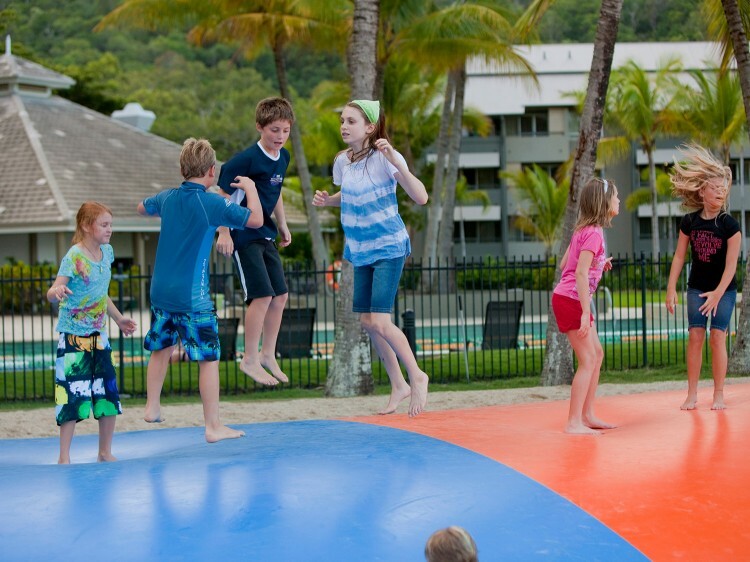 In addition there are three Queenslander-style cubby houses, miniature soccer field with goals, a climbing spider, sand pits, swings, slides and a 21m jumping pillow that is great fun for all ages. Open daily from 7:00am to 9:00pm. Prices include unlimited entry for one day: child - $4, adult - $6, family $20 (2 adults / 2 children). 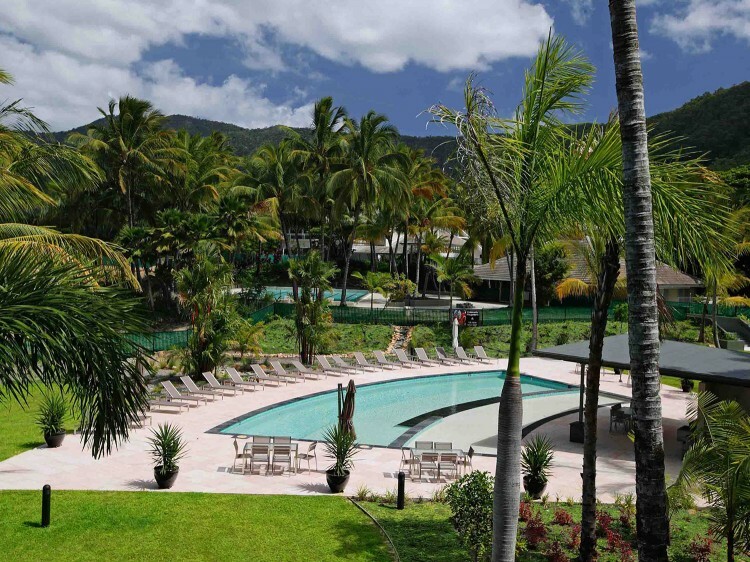 Swimming Pool - the terrace pool and toddler’s pool is surrounded by mature palm trees and gardens and is perfect to either incorporate into your fitness regime or relax on the deck chairs around the pool and soak up the resort atmosphere. Open daily from 6:00am to 6:00pm. 18 Hole Mini Golf Course - great fun for the whole family. The course is lit at night and is perfect for an after dinner activity on the school holidays. Putters and golf balls can be collected from the Golf Shop or Bar on the ground level of the clubhouse. Open daily from 7:00am to 9:00pm. Prices include unlimited entry for one day: child - $8, adult - $10, family $30 (2 adults / 2 children). Prices are correct as at January 2015 and are subject to change without notice. Spacious hotel-style room with private balcony, stunning mountain or golf course views and mini bar. Modern self-contained apartment with stunning mountain or golf course view, furnished balcony, full kitchen and laundry. Spacious apartment with mountain or golf course views, two bathrooms, two furnished balconies, full kitchen and laundry. This is a dual-key apartment combining a Resort Room and 1 Bedroom Apartment. Friday & Saturday: 7:00am to 11:00pm. Stay & Save Specials are heavily restricted. Full payment is required at time of booking. No date changes or amendments are allowed and the reservations are non refundable.